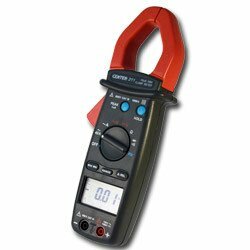 CENTER 210 series are mid-size clamp meters. These clamps can measure up to 1000A with resolution 0.01A. 1ms Peak function is also built-in this series of clamps. This is especially useful for start current measurement. Maximum, Minimum, and Hold function are also standard functions for these testers.